A majority of Oklahoma voters favor abolition of the death penalty if it is replaced with a sentence of life without parole plus restitution, according to a new poll commissioned by News 9/News on 6. The survey by the non-partisan SoonerPoll.com found that 52.4% of Oklahomans would support abolition of the death penalty if the state replaced its system of capital punishment with the alternative sanction of life without parole, plus a requirement that the inmates pay restitution to victims' families. Nearly a third of respondents (30.5%) said they would "strongly support" abolition if this alternative punishment option were offered. The gap between support for replacing the death penalty versus retaining it as is was more than 18 percentage points, with 34.0% of respondents saying they would oppose abolition. A poll commissioned by The Oklahoman in October that asked the general question whether Oklahomans supported or opposed the death penalty reported that 67% of Oklahomans expressed support for the death penalty, down from 74% support reported in a 2014 poll by the Tulsa World. The Oklahoman poll showed that, at the same time, half of Oklahomans favored a moratorium on the state's death penalty. “A lot of people are in support of the death penalty right now, because they were never given an alternative,” said Bill Shapard, founder of SoonerPoll.com. “Right now the death penalty is really the only alternative to those who have committed some of the worst crimes in our society. But yet, now we are given an alternative, people are open to that.” The results of the Oklahoma polls are consistent with national polls, which find that respondents say they support the death penalty in the abstract, but prefer life without parole over the death penalty when offered a choice between the two. Death row in Texas has shrunk from 460 men and women at its peak in 1999 to 260 today. The main reason for that drop, according to an article in The Texas Tribune, is the dramatic decline in death sentences imposed in the state. In 1999 alone, Texas sentenced 48 people to death. But in the first 6 months of 2015, no death sentences have been imposed in Texas. This development is unprecedented, according to the Texas Defender Service (TDS). “This is the longest we’ve gone in a calendar year in Texas without a new death sentence,” said Kathryn Kase, director of TDS. Kase said that a major factor contributing to the decline in death sentences is Texas' adoption of life without parole in 2005. “Life without parole allows us to go back and reverse our mistakes,” Kase said. “We can be really safe in these cases.” In the decade since life without parole became a sentencing option, Texas has averaged about 10 death sentences per year. In the prior decade, an average of 34 people were sent to death row each year. The Tribune reports that "Between 2007 and 2014, the number of life-without-parole sentences jumped from 37 to 96." Three death penalty cases have been tried in Texas so far this year, and all three resulted in sentences of life without parole. 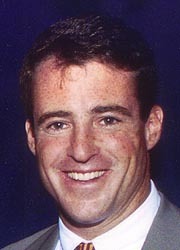 On November 6, Maryland Attorney General Doug Gansler (pictured) filed a brief with an appellate court, formally requesting that the death sentence of Jody Lee Miles be vacated. Gansler argued that Miles's death sentence is no longer valid. Miles was convicted and sentenced to death in 1998. In 2006, Maryland's Court of Appeals suspended executions because the state's lethal injection procedures had not been lawfully implemented. In 2013, the state repealed the death penalty for future offenses. Upon repeal, Miles filed a motion to have his sentence changed to life in prison without parole, arguing that the repeal should apply to him, too. However, the appellate court rejected the argument, stating that the repeal only applied to future convictions. Gansler's motion contended that the absence of an execution protocol rendered an execution in Maryland a "legal and factual impossibility." He requested that Miles's death sentence be changed to life in prison without parole, and he noted that a decision on this motion would leave the door "wide open" for challenges from the other three defendants on Maryland's death row. 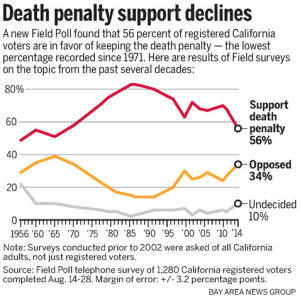 (Click to enlarge graph) A Field Poll of voters in California found that support for capital punishment has reached its lowest level since 1965. Only 56% of respondents said they favored keeping the death penalty, down from 69% in 2011. Support for the death penalty among Californians peaked in the mid-1980s at 83%. Some of the strongest opposition to keeping the death penalty came from voters under 30, African Americans, and Democrats. Daisy Vieyra, a spokesperson for the ACLU of Northern California, said support for capital punishment has declined because, "The public is becoming more aware of all the flaws that riddle the system." In 2012, a referendum to replace California's death penalty with life without parole almost passed, coming up short in a 52-48% vote. UPDATE: Winfield's execution was stayed on June 12 because of state interference with the clemency process. EARLIER: John Winfield is scheduled to be executed in Missouri on June 18 despite an affidavit submitted by one of the jurors at his trial stating she was pressured to switch her sentencing vote from life in prison to death. Kimberly Turner, who served on Winfield's jury in 1998, recently described the jury's initial deliberations: "Another juror and I had voted for life without the possibility of parole. That was my vote. In my heart, that has always been my vote." In Missouri, a jury recommendation for death must be unanimous; if just one juror votes for a life sentence, the defendant is sentenced to life. When the jury told the court they were unable to reach a unanimous sentencing verdict, they were told to continue deliberating. "Even though I had voted for life without parole," Turner said, "when an officer of the Court told me to keep deliberating, I thought that I had to. 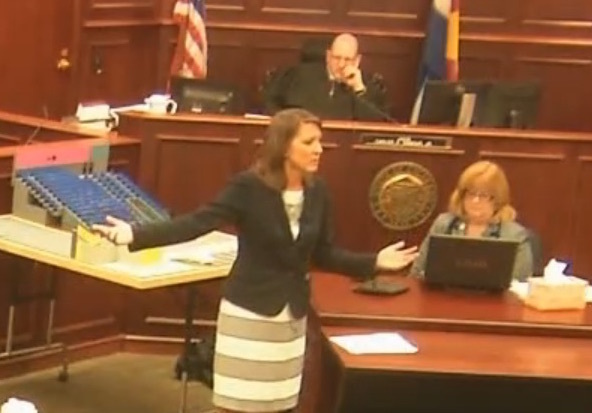 It was Friday afternoon and the other jurors were tired of being sequestered and wanted to go home. They were pressuring me and the other life vote to change our votes to death...As the afternoon went on, the other jurors wore me down. I had not wanted to keep deliberating, but after the order to continue, I did not know how long I was supposed to keep defending my vote for life...So I changed my vote to death. It is a decision that has haunted me." A new poll by ABC News and the Washington Post found a majority (52%) of Americans prefer life without parole as punishment for convicted murderers, with just 42% preferring the death penalty. This is the first time that this poll has found a majority support for life without parole over the death penalty. Without an alternative sentence offered, support for the death penalty was 61%, equaling the lowest level of support in polls going back to the early 1980s, and showing a significant drop since support for the death penalty peaked at 80% in 1994. Even among those who said they support the death penalty in the abstract, 29% preferred the alternative of life without parole when offered a choice between the two punishments. In states that do not have capital punishment, respondents were more likely to prefer life without parole (58%), with only 38% selecting the death penalty. Among the groups that had stronger than average support for life without parole were women (57%), nonwhites (65%), and Democrats (67%). A recent poll by Quinnipiac University found that Ohioans support life sentences over the death penalty for people convicted of murder. A total of 49% of respondents chose sentences of life without parole (40%) or life with parole (9%), compared to just 43% who chose the death penalty. The survey also showed a 4-point drop in death penalty support in just the last three months. In February, 47% of respondents said they preferred the death penalty. Death penalty support was much lower among blacks than among whites, with only 22% of blacks saying they preferred the death penalty over the life-sentence options, compared to 46% of whites. Among various age groups, younger people (age 18-29), showed the lowest support for the death penalty (33%) when compared to life sentences.